Sunshine just screams summer! 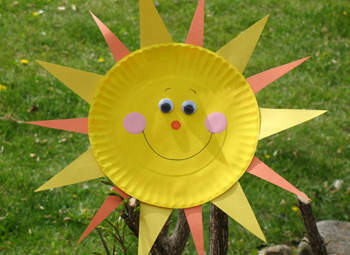 Kids can bring some sunny rays into the house, day or night, by making this easy craft. Paint the paper plate yellow and let dry. Cut seven large triangles from the yellow paper. Cut seven skinnier triangles from the orange paper. Use glue stick to add the triangles to the back of the painted paper plate. Keep the ends of the triangles about ½” from the rimmed line of the plate. Turn the plate over and glue on the googly eyes. Draw on a mouth and eyebrows. Dip the small round applicator into orange paint and dot on a nose. Use the large round applicator dipped in pink paint for the cheeks.